If you want a fast, easy, and accurate access to body measurement results including weight, height, blood pressure, and body fat estimation, just look for the body measurement machine at selected Mercury Drug store locations. 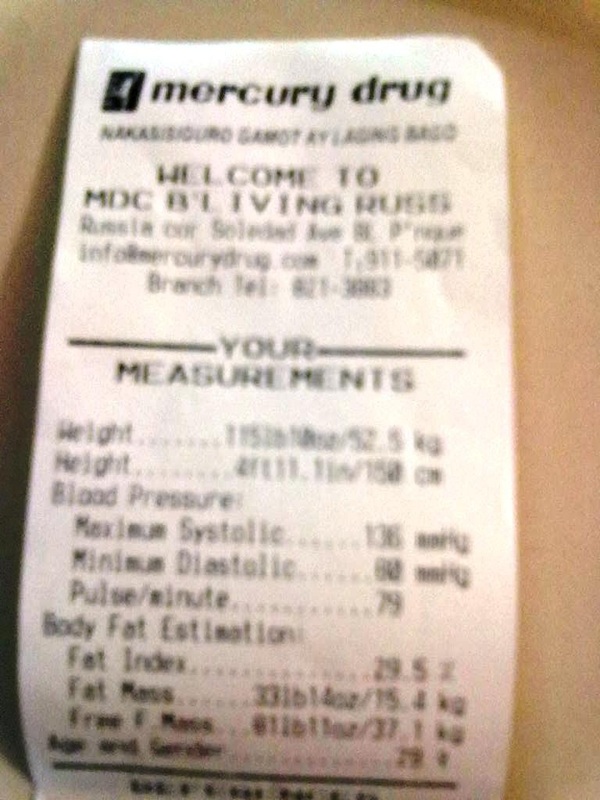 I found one of such tall machines performing body measurements over at Mercury Drug Better Living Russia corner Soledad Ave. in Paranaque city. The whole process takes less only a few minutes in its entirety and only requires a few five or ten peso coins to be dropped on the receiving slot, like a slot machine. The whole process is very simple too. There will be instructions available for you to read so you just have to follow each step one by one. Your bodily measurements will then be checked as you go through the steps. To begin, drop the coins on the appropriate slot. Let one of your hands rest of the blood pressure measuring cuff and wait for the machine to complete the process of measuring your maximum systolic and your minimum diastolic blood pressure. Next, you will need to stand on a built in platform for your height, weight, and body fat mass to be measured. The latter tells you whether or not you are at risk of being obese or overweight or if there’s too much accumulation of fat present in your body by measuring your body fat index and body fat mass. My results were relatively normal for my age and height. My height and weight are no secret either. J It’s nothing I should be afraid to show. After about 10-15 minutes, the entire process of measuring your body’s height, weight, and body mass is completed. The blood pressure is measured first before you stand on the platform. The results will then be displayed on the screen. You will have an opportunity to have it printed afterwards, still like a bank teller machine ATM. So you will just have to wait for the slip to be served in a receipt. The image above shows the results I got for my personal test. With the Mercury Drug body measurements machine, you won’t have to wait in line at hospitals or clinics. You won’t have to buy your own equipments or tools too to measure height, weight, blood pressure, and most importantly body mass. Just drop by any of the Mercury Drug pharmacies close to you and find out if they have this machine available.